Organizes bakery workshop for Bavdhan Village house wives under "Women Empowerment' Program on the occasion of "International Women's day"
International Women’s Day (IWD), also called International Working Women’s Day, is celebrated on March 8 every year. In different regions, the focus of the celebrations ranges from general celebration of respect, appreciation and love towards women to a celebration for women’s economic, political, and social achievements and empowerment. Suryadatta Institute of Hospitality Management & Travel Tourism and had organized a Bakery Workshop for Bavdhan village Housewives at Hotel management campus, as a part of suryadatta edu-socio initiative (women empowerment). Chef Instructor Prem Suryawanshi and third year students of BSc HS has activity coordinated the event. On the occasion. These activities will strengthen women's strength. Suryadatta Institute have always implemented these kind of activities. That is appreciating. From this activities women’s can definitely lead to cook various recipes for the family and also encourage to open own small to large scale business. National Service Schem Volunteer students also had learning lesson on conducting event and had great learning experience, where as participant women learnt various cup cakes, cakes and cookies and assure that they will make at home as well. As a responsible corporate citizen and educational Institution, Suryadatta Group of Institutes does not lag behind in conducting various social activities. SCHMTT has organized Blood Donation Camp at institute on 7.10.2017 with Deenanath Mangeshkar Hospitali & Research Center. Students staff and faculty members fromSCHMTT and other colleges has taken part in blood donation and has donated blood responsibly. SCHMTT every year organises blood donation and Health Checkup camp and students take part volunteerand serve nation as a responsible citizen. SCHMTT promotis various social awareness programmes and sensitizing and educating its students to be good corporate citizens. Every year, a minimum of 3 to 4 such programmes are organised. Through its Edu Socio Connect, Suryadatta has been enabling sustainable development for the benefit of society. The students were awarded certificates from the Deenanath Mangeshkar Hospitali & Research Center. Suryadatta Education Foundation, Bavdhan has organized diabetic checkup camp and diabetic awareness human chain rally on 14th Nov 2016, Monday. National Service Scheme unit and all the college students, schools children’s, Jr. College and citizen of Bavdhan village has participated in the human chain rally with posters indicating the care and precaution to take before and after diabetic symptoms. Dr. Mutha has given guidelines on how to treat diabetic in daily life and what precaution to take, which food to eat and many more information shred by him about this topic. Management, staff , students and villagers have taken advantages of free camp by checking blood sugar, fat and weight during this camp. All the students and staff members of Suryadatta Celebrate RastriyaEkta Divas by Pledging for Social, Economical and Ethical Equality among all and thereby Achieving Peace, Prosperity and Progress of the Nation. In Suryadatta Group of Institutes, Bavdhan Campus, Birth Anniversary of SardarVallabh Bhai Patel was celebrated as RastriyaEktaDivas by organizing various events by the students and staff from morning till afternoon. The best part of this celebration was that the students from K.G. to P.G. and staff from the level of Peons to Professors united together to celebrate this special day. In fact inSuryadatta this is a usual and normal pattern of functioning. The citizens applauded the Rally enroute because it reflected the innocence and purity of children’s heart. The Rally ended with a meeting at SuryadattaBavdhan Campus wherein floral tributes were offered to the portrait of Sardar Patel. Dr. S.B. Chordiya addressed the Rally by explaining greatness of Iron man of India, SardarVallabh Bhai Patel who was the first Deputy Prime Minister and Home Minister of Republic of India. He impressed upon the audience that it was possible to integrate all the 600 princely states in One United India only because of strategic leadership of Sardar Patel and therefore Sardar Patelwas known as Chankya of Indian Politics. Dr. Chordiya told audience that SardarVallabh Bhai Patel was interested not only in Geographical unity of the country but removal of social inequality and all Indians working unitedly, as children of Mother India. The students and the staff of Suryadattapledged to dedicate themselves to preserve the unity, integrity and security of the country. The staff of Suryadatta resolved that they would strive through their ethical behavior to groom and mentor the students to make them responsible citizens of the country and better human beings of the entire mankind. The students also resolved that they would be punctual in all activities respect their teachers and parents. They will also help their juniors to emerge as conquers and shun from negative activities like ragging, negative habits etc. Their each step will be towards Clean India and Healthy India and they will make their Mother India proud for having such gems as her citizens. The program ended with Management and fun games in which students and staff of all the levels joined and enjoyed thoroughly. We are moving in the 21st century. Equality of men and women are the culture in our country. Because of this the empowerment of women is the need of the hour. That was their sincere efforts to empower women in the family and training fashion designing with subject, the Group of Suryadatta Institute founder and President Dr. Sanjay choradiya said today. On behalf of the Group of the Suryadatta Institute and Rushikesh Sutar, Chandrakant Gogavale, Jyoti Konde had organized a month of training in fashion designing for women and girls from economically backward families. Fashion design training imparted to over 160 women, as a part of Suryadatta edu-socio initiative (women empowerment) Dr. Chordiya said. The MNS Pune City President Hemant Sambhus, Jyoti Konde and Chandrakant Gogawale, Rushikesh Sutar, Prof. Fulchand Chate and Coach Kalpana Shinde were present on this occasion. Economically backward women and girls have got the confidence through this training. In this field of Apparel and Garment stitching or fashion designing, 100 designs of jewelry designing, jam and jelly making, making of 36 types of spices, spoken English (for auto rickshaw drivers, railway cools) Baking classes, IT classes for senior citizens. Although the need for education and skills along with the knowledge and practical educated person in today's world. If a woman is competent then she is able to do her family competent. ‘The institutions and faith Suryadatta Institute and Rushikesh Sutar, Chandrakant Gogawale, Jyoti Konde was taken jointly training classes of fashion Designing’, the Dr. Chordiya said. These activities will strengthen women's financial strength. Suryadatta Institute has always implemented these kinds of activities. That is appreciating. From these activities women’s can definitely lead to ‘ache din’, Said Hemant Shambhus. ‘Recognizing the need for society to this initiative. The best way for women's economic empowerment’, said Prof.Fulchand Chate. Rushikesh Sutar and Chandrakant Gogawale express their thoughts on this occasion. The program was anchored by Jyoti Konde. Through his nobles actions Dr. Sanjay B. Chordiya, Founder, Presidents & Chairman of Suryadatta Group of Institutes, who is believer of “Education to All”, always shows the way to follow his footsteps and inspires to outreach the needy deserving people of the society. This year Dr. Sanjay B. Chordiya and his daughter Dr. Kimya Chordiya’s Birthday was celebrated in a unique manner on the very opening day of the School and Junior College; 16th June 2016, by distributing school bags containing 10 Note Books & a compass box to 200 needy students from draught affected areas of Maharashtra. The generosity was executed through the students of Suryadatta National School, Bavdhan. (CBSE Affiliated). The very purpose of doing so is while extending the help, the young minds also should learn a lesson & emulate it when they are capable to do so. This indeed is a ‘Sanskar’; the Enculturation, which will be imbibed by the young generation of India. Apparently the gesture may be monetarily evaluated as a small step but philosophically it is a step of ‘Vamna’, covering the entire universe. It is the squirrel’s help to Lord Rama in building the bridge across the ocean. On this occasion, Shri Dhiraj Ghate, President of Sane Guruji Mandal, who was the chief guest recalled how he is associated with Dr. Chordiya’s Social work since the inception of Suryadatta Group of Institutes. He recalled that Suraydatta was pioneer in starting IT classes for the students in 1999 when the technology was new. He also said that at that time stalwarts like Mr. Nitin Gadkari and Mr. Manohar Parrikar had praised the social initiatives taken by Suryadatta Group of Institutes. Mr. Dhiraj Ghate emphasized that this is not an event but a moment which will continue in the draught situation in Maharashtra is totally eradicated. He further elaborated that to commemorate the 125th Birth Anniversary of Dr. Babasaheb Ambedkar, the key creator of Indian Constitution it was pledged to reach and help 1,25,000 economically challenged students, belonging to farmers families from the draught affected areas of Latur, Beed, Vidarbha, Marathwada, to complete their education by providing them notebooks, school bags, stationary etc. which is their day to day requirement for the study purpose. He announced proudly that so far study material of worth Rs. 25,00,000/- has been collected and in the month of July it will be given to the above category students at the hands of honorable Chief Minister of Maharashtra, Shri Devendra Fadanvis. Mr. Dhiraj Ghate cited few of his experiences of how students have stopped the celebrations of their birthdays or young generation stopped unwanted undesired expenditure of their marriage celebration and donated that part of sum for helping the draught affected students. After listening to such stories many students and teachers from Suryadatta vowed that they too will celebrate their special occasions by donating for such noble cause. Dr. Sanjay. B. Chordiya appealed that each organization and its members should extend help to best of their capacity for economically challenged and needy students. This will help to reduce the imbalance among the students belonging to different strata of the society. Dr. Kimaya Chordiya (M.D.) expressed her feelings by saying that celebrating the birthday in such manner has given her inner satisfaction and sense of belonging to the down trodden part of the society. She says that this is her art of living. Earlier in Dec 2015 Dr. S.B.Chordiya has motivated the student of Suryadatta Group of Institutes to collect food grains for the draught affected the farmer families of Maharashtra. The Collected Grains were sent to the needy, rural pockets of the Maharashtra through the Gram Panchayat members of Bavdhan. Dr. Sanjay. B. Chordiya propagates, “It is essential to build better character in students to make them better Human Beings and thus to transform our future young aspirators into efficient and effective Managers, Leaders & Entrepreneurs”. National Service Scheme (NSS) was introduced by the Savitribai Phule Pune University in 1969. Since then it has been playing a vital role in enriching the souls and minds of the students of the university. The overall objective of this scheme is ‘Education and Service’ to the community and by the community. It is a program for students to cater to the needs of the community, as and when required. The students joining this scheme develop many behaviorial interactive skills. They visit the rural areas as NSS volunteers during the camps organized by the concerned colleges or departments of the university. Thus the ultimate goal of the scheme is to strive to inculcate the bond of patriotism, national integration, brotherhood, communal harmony among these volunteers. The Camp was conducted as per guidelines given by the National Service Scheme department of SPPU, Pune. It was inaugurated by the Sarpanch and Principal of Bhugao Zilha Parishad School. In the afternoon the School premises was cleaned by the students. The next day the NSS volunteers (faculty and students) went to the old temple on the hillside near the Lake and cleaned the temple and lake side. They collected all the plastic and garbage and disposed it.In the afternoon a Rally on road safety was conducted as an awareness program for the villagers. The students displayed posters on road safety at the main road of Bhugaon. Other programs conducted during the Camp were- rally on “Beti Bachao – Beti Padhao”( Save the girl child- Educate the girl Child), street plays in village and school on “Nasha Mukti”( Freedom from alcoholism) and cultural shows for the school children. Coloring of stones as road marking on the main road and conducting various surveys for Gram panchayat. Cleaning Public places, “Plastic Mukt Gaon Abhiyan”(A plastic free village campaign), Tree plantation at Temple, Construction of “Compost pit” in the School and painting of plants in the School ground and in front of gram panchayat. The Gram panchayat appreciated the good work of the NSS volunteers and faculty and issued certificates for the same.This camp brought great happiness to the students as they had contributed willingly for the betterment of the society . As a responsible corporate citizen and educational Institution, Suryadatta Group of Institutes does not lag behind in promoting various social awareness programs and sensitizing and educating its students to be good corporate citizens. Every year, a minimum of 3 to 4 such programs are organized. Through its Edu Socio Connect, Suryadatta has been enabling sustainable development for the benefit of society. Suryadatta College Of Hospitality Management, Travel And Tourism, Pune with an idea of empowering women and making them 'self independent' organized a ‘Workshop on Bakery’.The women were taught how to make cookies, cake and bread. They were also explained the importance of hygiene and storage temperatures. All the women eagerly participated in the workshop and were very pleased to learn how to make the products which till date they had only bought from shops. They said they were happy that they could now make the products themselves and also use this skill to become self employed. All the participants were awarded certificates by the Chairman and Founder President Dr Sanjay B Chordiya and Mrs Sushma Chordiya. Defining education and environment as the pillars of a budding society, the Suryadatta Group of Institutes group participated in a rural socio initiative of rice crop plantation in a rural area of Vinzar, Dist Velhe close to Pune organized by Vanarai. This program is a part of Suryadatta Edu Socio Initiative where around 400 students of Management, IT and Hotel Management of the Suryadatta Group of Institutes executed this unique and enriching program of Rice Crop Plantation in association with Vanarai which offers support to farmers of the country. 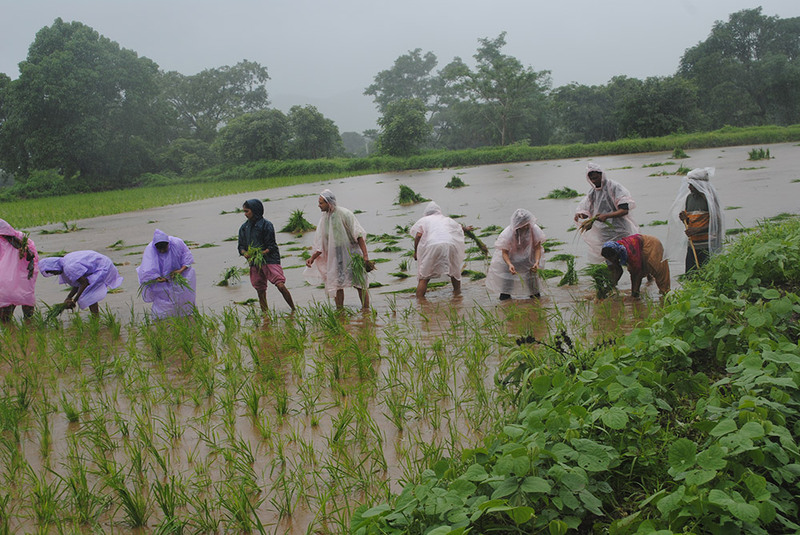 The students worked with dedication throughout the day and planted rice crop in 40 farms in a single day to help the farmers.